Tinted Day Cream richly moisturises the skin and gives it a subtle, natural glow. Combining nourishing avocado and almond oils with protective rose wax, beeswax and quince seeds, it helps prevent dryness by balancing the skin’s oil and moisture levels and supporting its natural moisturising functions. Rose, quince and St. John’s wort tone the skin and support elasticity, while nourishing rose water and extracts of kidney vetch have a balancing, harmonising effect. Tinted Day Cream nourishes dry, sensitive, reddened and mature skin, harmoniously blending with your own natural skin tone for an even complexion. Without doubt the best tinted day cream out there. Natural healthy glow all year round. It has a distinct but not unpleasant fragrance but it disappears quickly. Adapts to your skin tone for an even light coverage beautiful product....you will not be disappointed. I can highly recommend this wonderful Tinted Day Cream. It is very pleasant and the skin feels nourished all day long. The colour is just perfect for a natural, healthy look and have a good coverage and therefore I don’t need to wear make up. I love this one! It’s quite thick but for my aging dry skin it feels magic. Just the right kind of tint for an ever so slight glow. Will buy again. I thoroughly recommend this cream, which I have used now for some years. This product is really good because it gives a great colour to the face. Skin looks radiant and healthy. Especially in the winter, it helps my skin go from dull to skin-kissed. Really lovely if you don't have time to apply foundation, gives a nice colour. As a male i was looking for a tinted moisturizer that doesn't look like make up and this was the answer! 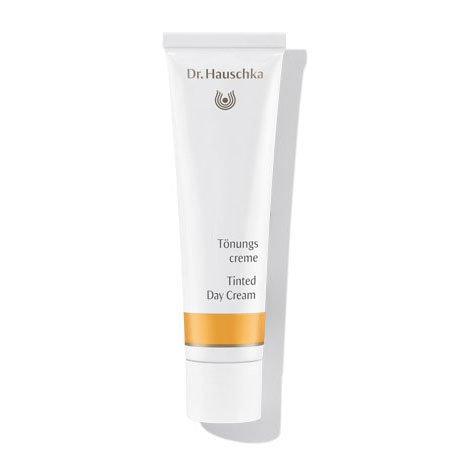 I love all of Dr Hauschka products and this moisturizer didn't disappoint! It's hydrating, it's even out my skin and gives a beautiful summer glow! Sun kissed without the damaging sun light! I love it! You only need a all amount to cover the face and hydration last all day! I couldn't ask for more! It calms my skin, hide any redness and i have to admit, I'm addicted to the smell of the product! And a tip for you- of your SPF leaves a white cast ( many does) put this on top and you're ready to go! It can make my face look shiny. I find I do need to use moisturiser before applying the tinted cream because the tinted cream alone does not spread evenly and my skin is dry in the winter. If I want to use your product in the summer does it have any sun protection? Too greasy for my skin and did not suit me. Although the product was of very high quality and felt good to apply, the colour was too dark for me . Perhaps a range of tints would give users more choice.